Kingdom Hearts 358/2 Days[a] (subtitle read as "Three Five Eight Days Over Two") is an action role-playing video game developed by h.a.n.d. and Square Enix for the Nintendo DS. It is the fifth installment in the Kingdom Hearts series, and takes place near the end of the first game, continuing parallel to Kingdom Hearts: Chain of Memories. The game was released worldwide in 2009. The story is told from the perspective of Roxas, following his daily life within Organization XIII and his relationship with fellow Organization member Axel; it also introduces a fourteenth member, Xion, who becomes friends with the former two. Kingdom Hearts 358/2 Days was directed by Tetsuya Nomura and Tomohiro Hasegawa. Nomura decided to develop a game for the Nintendo DS, and once a system had been chosen, decided upon Roxas as the protagonist. The development team wanted to use gameplay similar to previous Kingdom Hearts games but could not due to the insufficient number of buttons the DS had. Following its release, Kingdom Hearts 358/2 Days received generally positive response by critics, with praise directed at the gameplay and graphics, and criticisms directed towards its storyline. A soundtrack, various light novels, and a manga series based on the game were released in Japan. 358/2 Days features the combination of action role-playing game/hack and slash style of the previous games in the series. To accomplish this, the game makes minimal use of the system's touch screen functionality, and it is possible to play and complete the game without using it at all. The game includes single player and multiplayer modes of play. The single player mode is story-based, the player controls Roxas, who is accompanied by other Organization XIII members on daily missions to Disney worlds from the previous games. The two modes are linked in that character growth is shared between them. 358/2 Days features a new gameplay mechanic known as the panel system which involves the customization of the character's levels, items, equipment, and abilities. For example, certain magic spells cannot be used if their corresponding panels aren't equipped, but can be used consecutively if multiple are attached. Some panels also occupy multiple slots, but can be combined with other panels to form new or stronger abilities. Limit Breaks, which previously featured in Square's Final Fantasy series, can be activated during a battle once the character's health drops below a certain level, indicated by a yellow health bar. Each character has their own unique abilities during Limit Breaks which allow a temporary boost to their normal abilities, whether it be increasing the attack strength or allowing multiple enemies to be attacked at once. The second stage of a Limit Break known as Final Limit is normally a different or powered-up version of the first and begins at the point where the white line (starting at the high end of the yellow portion of the HP bar) meets top dead center. This is the first Kingdom Hearts game to feature cooperative multiplayer. The multiplayer gameplay is separate from the single player story and is mission-based, including cooperative and competitive player battles. Up to four players can play as one of the fourteen members of Organization XIII, with each member having different weapons, skills, and stats. Sora, Donald, Goofy, King Mickey, and Riku are featured as secret characters in the multiplayer who are unlockable while playing through the main story. 358/2 Days' multiplayer also features a chat system for communication between players, but differs from PictoChat in that everyone can draw on the same screen. To prevent players missing out on multiplayer content, the games were developed so that the missions could be completed without the need to connect with other players, instead utilising AI-controlled partners. Kingdom Hearts 358/2 Days begins concurrently with the events of the original game and Chain of Memories. Like the other games in the series, the player progresses through a collection of various worlds, based on various locales from the Disney animated features canon: Agrabah from Aladdin; the Beast's Castle from Beauty and the Beast; Olympus Coliseum from Hercules; Halloween Town from The Nightmare Before Christmas; Wonderland from Alice in Wonderland; and Never Land from Peter Pan (featuring a string of islands new to the series rather than Captain Hook's pirate ship and Big Ben from the first game). The game also features worlds created specifically for the series by Square Enix. The most prominent world is The World That Never Was, which first appeared in the secret ending of Kingdom Hearts and serves as the game's main hub, followed by Twilight Town, a frequently-explored locale. Castle Oblivion and Destiny Islands also appear in cutscenes. The game revolves around Roxas, who was first featured at the beginning of Kingdom Hearts II. Roxas is the Nobody of Sora, the series' protagonist, born when Sora's body vanished as he briefly lost his heart and became a Heartless, and joining Organization XIII, a group of powerful Nobodies who serve as the antagonists of Kingdom Hearts: Chain of Memories and Kingdom Hearts II. Like Sora, Roxas has the power to wield the Keyblade, a weapon normally used for battling darkness. The other members of Organization XIII play a prominent role as well, particularly Axel, Roxas's best friend who debuted in Chain of Memories. The game also introduces a new member: Xion, a girl resembling Kairi who, like Roxas, can wield the Keyblade. Other characters who are featured include Naminé, a girl with the power to manipulate memories; DiZ, an enigmatic man wrapped in bandages; Riku, Sora's best friend; and King Mickey, Riku's ally and ruler of Disney Castle. Sora, the main character of the previous games, is featured prominently in the plot, along with his allies Donald Duck and Goofy, though they appear infrequently in the form of several flashbacks and memory-induced scenarios. Also appearing are Pete, a persistent villain who first appears in Kingdom Hearts II, and Hayner, Pence, and Olette, a trio of friends living in Twilight Town who also debuted in Kingdom Hearts II. As with the other games in the series, each Disney world features several characters who appear in the films their worlds are based on; on the other hand, no Final Fantasy characters are featured apart from a Moogle managing a shop for the Organization. The newly born Roxas is discovered in Twilight Town by Xemnas, the leader of Organization XIII, who recruits him as their thirteenth member. Unlike other Nobodies, Roxas lacks memories of his original self and develops a personality of his own as time passes. Roxas is sent on daily missions to other worlds, either alone or accompanied by a fellow member, to destroy vast quantities of Heartless and release stolen hearts with his Keyblade, which furthers the Organization's goal of creating Kingdom Hearts and becoming complete beings. Roxas is placed under the tutelage of fellow member Axel, whom he becomes close friends with. After Axel and several other members are reassigned to Castle Oblivion, Roxas partners with Xion, a fourteenth member inducted shortly after Roxas. Roxas and Xion bond over their similarities, including Xion's ability to wield a Keyblade and inability to recall her human life. Some time later, Roxas falls into a coma caused by the alteration of Sora's memories, and does not revive until several weeks later, when Axel returns from Castle Oblivion as the only survivor of the group. Over time, Xion develops a friendship with Roxas and Axel, eating sea-salt ice cream with them after missions at the Twilight Town clock tower. Xion soon falls into a coma after failing to eliminate Riku; like Roxas, she has visions of Sora after waking. In time, Xion questions her own existence, distancing herself from Roxas and Axel to learn more about herself. She eventually discovers that she is an artificial replica created as a fail-safe for Roxas, and that her existence prevents Sora's memory from being completely restored. Xion is torn between staying with her friends and merging with Sora as per Riku's advice, but ultimately chooses to escape from the Organization after she begins siphoning Roxas' strength. Axel allows Xion to escape, but loses Roxas' trust. Upon learning Xion's identity from Xemnas, Roxas begins to question his own identity and defects from the Organization in search of answers, leaving Axel dejected. At Twilight Town, Roxas confronts Xion, whom Xemnas has altered to perform her initial purpose of absorbing Roxas and becoming a perfect copy of Sora. After being defeated, Xion's body dissipates and merges with Sora, causing all memory of her existence to vanish. Returning to the World That Never Was to stop Xemnas' plan as per Xion's last request, Roxas encounters Riku, who attempts to capture him for DiZ and resume Sora's memory restoration process, which has completely halted. When Roxas overpowers him, Riku releases the darkness suppressed within his own heart, giving him the power necessary to subdue Roxas, but also giving him the physical form of Xehanort's Heartless, Ansem, who resides in his heart. DiZ inserts Roxas into a virtual simulation of Twilight Town without any of his memories of the Organization so that Roxas may eventually merge with Sora. 358/2 Days was developed by h.a.n.d., with Square Enix employees overseeing the process. The game was directed by Tetsuya Nomura and co-directed by Tomohiro Hasegawa. In 2007, Nomura mentioned he wanted to do a spin-off Kingdom Hearts game on a mobile platform and wanted the game to play slightly different from the other titles already in the series. 358/2 Days was announced alongside Kingdom Hearts Birth by Sleep and Kingdom Hearts coded at the Tokyo Game Show on September 20, 2007, where a trailer was shown in a photo-prohibited theater. New trailers were shown and a playable demo was available at the 2008 Jump Festa in December 2007 and the DKΣ3713 Private party in August 2008. Both single player and multiplayer demos were featured. Xion was also shown in the new trailer and in the multiplayer demo. The Nintendo DS was chosen as the system before design work on the game had begun. 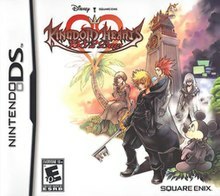 Roxas was chosen as the game's protagonist as the staff thought that having a main character besides Sora would help to introduce gamers to the series' first Nintendo DS title. The staff thought that Roxas' role as a member of Organization XIII would be a suitable theme for the plot. This idea was furthered during the development of Kingdom Hearts II, where the staff wanted to focus on what influenced Roxas to leave the Organization, which resulted in the creation of Xion's character who was connected with Roxas' origins. 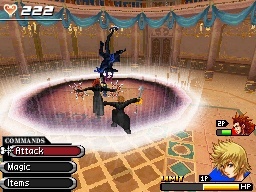 The development team wanted to have gameplay similar to previous Kingdom Hearts titles, but stated the number of buttons on the Nintendo DS was a problem. Some of the DS's functions, like the stylus, are not used in order to retain the similar gameplay from previous titles. Roxas seeing Sora's memories is incorporated throughout the game and has different types of gameplay for each world. The game's logo uses warm colors as a reference to the sunset in Twilight Town. The meaning behind the title, "358/2 Days" was left unexplained by Nomura during the promotion of the game. Upon completion, the player discerns that it references the story of Xion and Roxas, and their 358 days as members of Organization XIII. Though Birth by Sleep was the first of the three new games to begin development, 358/2 Days was released before it. The game was slated for a release at the end of 2008, but Square Enix pushed the date to February 2009. Once again the game was delayed for Japanese release until May 30, 2009. A release in North American territories was announced on December 2, 2008. The official English trailer for the title was shown at Nintendo's press conference at E3 2009, confirming a release date of September 29, 2009 for North America and October 9, 2009 for Europe. 358/2 Days was originally to have featured a world based on Pinocchio, as evidenced by unused character portraits for Honest John, Gideon, Gepetto, and the eponymous character as a real boy, but this was cut due to space restrictions. The game received an average score is 75 out of 100 on Metacritic. Prior to the game's release, Nintendo Power's Chris Hoffman and Steve Thomason referred to the game as highly anticipated, and considered it one of the better titles displayed at the 2008 Tokyo Game Show. The game was met with a range of reviews, ranging from mediocre to positive, where most of the focus was on the game's graphics and storyline. The graphics of the game were heavily praised by many reviewers, with Hoffman and Thomason going as far as to call them among the best on the system, and complimented the familiar feel of the gameplay and its transition between the PlayStation home consoles and the portable Nintendo ones. Game Informer gave the game an 8 out of 10, praising the graphics for excellent production values and the journey of the camera controls from the PlayStation Analog Stick to the DS shoulder buttons. The Japanese gaming magazine Famitsu gave the game 9/9/9/9 (36/40) and praised the graphical quality of the game saying they were at a level which had not been seen on a DS before, further complimenting the gameplay mechanics and missions. They were also particularly impressed with the new panel system which allows the player to customize their fighting techniques as well as the ability to customize the characters from the Organization. Unlike many other reviewers, they praised the story as "strongly captivating." The Australian video game talk show Good Game's two reviewers gave the game a 7/10 and 7.5/10, grateful that the game didn’t force the use of the stylus, especially when it came to battle. The RPGFan reviewer gave the game an 81 out of 100, praising the visual and aural quality, however they expressed disappointment at the recycling of most of the music from Kingdom Hearts and Kingdom Hearts II. Kevin VanOrd of GameSpot was complimentary of the single-player mode, commenting specifically that the artificial intelligence-controlled Organization XIII members were helpful and competent. He also praised the multiplayer mode's gameplay, calling it "fun" and citing the ease of using magic spells and items. The controls and overall story were of particular criticism by the reviewers, with VanOrd stating that the on-screen character ended up in one of the game field's corners often. RPGamer was highly critical of these facts, as it handed the game a 2.5/5 score and reviewer Alex Reimer concluded, "...many fans of the series may be turned off by the lackluster controls and odd story directions taken with this portable spin-off." The Official Nintendo Magazine gave the game a mediocre score of 69% praising the graphics and gameplay, they were critical however of the constant backtracking and confusing plot. Good Game's reviewers stated that while the plot was confusing, and made little sense for players new to the series, it still drew the player in and filled in the gaps of the storyline for continuing players of the series. They surmised that the repetition of worlds and missions, and overall lack of variety, combined with lengthy storytelling really hurt the gaming experience. Kingdom Hearts 358/2 Days was the top-selling game during May 2009 in Japan at 291,000 copies, even though it was released during the final week of the month. The following week, it was again the top-selling game in the region at 106,000 copies. By August 2009, the game sold 490,000 copies in the region. It was also one of the most reserved games for the DS. By the end of 2009, the game sold a total of 571,981 copies in Japan alone making it the twelfth best-selling game in Japan of 2009. NPD Group sales data shows the game has sold over 360,000 copies in North America as of October 2009. In November 2009, Square Enix announced the game had sold 1.22 million units worldwide. The game was nominated for 7 awards in the Nintendo 2009 Power awards: Nintendo DS Game of the Year, Best Sound/Voice Acting, Best Adventure Game, Best Nintendo DS Graphics, Best New Character (Xion), Best Story/Writing, and Overall Game of the Year. On February 16, 2010, it was announced that 358/2 Days won all seven of the awards that it was nominated for in the reader's vote. A special Kingdom Hearts 358/2 Days-themed edition of the Nintendo DSi was released alongside the game when it launched in Japan. An Ultimania guidebook of the game was released by Square on June 25, 2009. Kingdom Hearts 358/2 Days was re-released as part of the "Kingdom Hearts 10th Anniversary Box" package made in commemoration of the franchise's 10th anniversary on March 29, 2012 alongside Kingdom Hearts Re:coded and the debuting Kingdom Hearts 3D: Dream Drop Distance. The musical themes introduced in Kingdom Hearts 358/2 Days were included in a CD that collected tracks from Kingdom Hearts Birth by Sleep, Kingdom Hearts Re:coded and 358/2 Days released on February 2, 2012. Square Enix published a series of light novels based on the title written by Tomoko Kanemaki and illustrated by Shiro Amano. The first volume, The 14th, was released on July 30, 2009 and the second, Go to the Sea, on January 28, 2010, and the third and last volume, Xion-Seven Days, in May 2010. A manga adaptation by Amano was serialized in Square's Monthly Shōnen Gangan from August 2009 to August 2012. A total of five tankōbon volumes were released between June 22, 2010, and April 21, 2012. In September 2012, Square Enix announced Kingdom Hearts HD 1.5 Remix a compilation for the PlayStation 3 to include both Kingdom Hearts Final Mix and Re:Chain of Memories in high definition and trophy support. Additionally, the collection includes HD cinematic scenes from Kingdom Hearts 358/2 Days. The idea of a full remake, like Kingdom Hearts Re:Chain of Memories, was considered for Kingdom Hearts 358/2 Days. However, it was later scrapped in favor of an almost 3 hour long cinematic retelling of the game. New voice work was done for 358/2 Days and the HD collection has "70% of the main plot." It was released in Japan on March 14, 2013, in North America on September 10, 2013, in Australia on September 12, 2013 and on September 13, 2013 in Europe. A PlayStation 4 version of the Kingdom Hearts HD 1.5 Remix compilation was released on March 9, 2017, in Japan, March 28, 2017, in North America, and March 31, 2017, in Europe. A piece of downloadable content for the PlayStation 4 version adds an additional scene to the cinematic, depicting the battle between Roxas and Xion. ^ Japanese: キングダム ハーツ 358/2 Days, Hepburn: Kingudamu Hātsu Surī Faibu Eito Deizu Ōbā Tsū? ^ "Kingdom Hearts シリーズ 新プロジェクト" (PDF) (in Japanese). Square Enix. Archived (PDF) from the original on 2008-08-20. Retrieved 2007-09-20. ^ a b c "KINGDOM HEARTS 358/2 DAYS TO LAUNCH IN NORTH AMERICA ON SEPTEMBER 29, 2009". Square Enix. 2009-06-03. Archived from the original on June 7, 2009. Retrieved 2009-06-03. ^ a b Ashcraft, Brian (2009-03-05). "A DSi Fit For Mickey Mouse And Square Enix". Kotaku. Archived from the original on 2009-03-08. Retrieved 2009-03-05. ^ "Play.com (UK) : Kingdom Hearts: 358/2 Days : Nintendo DS". Play.com (UK). Archived from the original on 2009-07-28. Retrieved 2010-01-16. ^ Yoon, Andrew (2007-09-20). "TGS07: Impressions of Kingdom Hearts: Coded and 358/2 Days". Joystiq. Archived from the original on 2007-09-25. Retrieved 2007-09-21. ^ a b c d e f Gantayat, Anoop (2007-10-02). "Nomura Discusses Kingdom Hearts". IGN. Archived from the original on 2012-03-22. Retrieved 2007-10-04. ^ Square Enix (2007-09-20). "A New Chapter in the Kingdom Hearts Series Delivers Three Brand-new Titles to the Nintendo DS, PSP, and Mobile Phones". GameSpot. Archived from the original on 2007-10-27. Retrieved 2007-09-21. ^ a b c Niizumi, Hirohiko (2007-09-20). "TGS '07: Square Enix shows all in closed mega-theater". GameSpot. Archived from the original on 2007-10-13. Retrieved 2007-09-21. ^ a b c d e f IGN Staff (2007-09-26). "Kingdom Hearts DS Update". IGN. Archived from the original on 2007-10-13. Retrieved 2007-09-27. ^ a b Haynes, Jeff (2008-08-02). "Kingdom Hearts 358/2 Days Trailer Impressions". IGN. Archived from the original on 2008-08-05. Retrieved 2008-08-05. ^ a b "Kingdom Hearts 358/2 Days For Nintendo DS - Review". G4TV. 2009-09-25. Archived from the original on 2009-10-07. Retrieved 2009-09-25. ^ a b "Kingdom Hearts 358/2 Days Review". IGN. 2009-09-28. Archived from the original on 2009-10-03. Retrieved 2009-09-29. ^ "Kingdom Hearts 358/2 Days Nintendo DS Gameplay - Limit Break Montage". IGN. 2009-08-27. Archived from the original on 2009-12-19. Retrieved 2010-01-16. ^ a b Game Informer Staff (December 2007). "Photophile - Kingdom Hearts: Birth by Sleep". Game Informer. Cathy Preston (176): 125. ^ Siegel, Scott (2007-09-20). "TGS07: New Kingdom Hearts games coming to DS, PSP, mobile". Joystiq. Archived from the original on 2012-01-31. Retrieved 2007-09-21. ^ a b Onyett, Charles (2007-09-19). "TGS 2007: Three New Kingdom Hearts Titles". IGN. Archived from the original on 2013-08-30. Retrieved 2007-09-20. ^ a b c S., Enrico (2007-12-22). "Jump Festa 2008 - Kingdom Hearts Coded, 258/2 Days, Birth by Sleep details". QJ.net. Content Holdings, LLC. Archived from the original on 2008-01-01. Retrieved 2008-01-02. ^ Boyes, Emma (2007-09-20). "TGS '07: Three new Kingdom Hearts games coming". GameSpot. Archived from the original on 2008-12-01. Retrieved 2007-09-20. ^ "Kingdom Hearts 358/2 Days screenshots". Gamekyo. 2008-08-28. Archived from the original on 2008-08-30. Retrieved 2008-08-31. ^ Square Enix, h.a.n.d. (2009-09-29). Kingdom Hearts 358/2 Days. Nintendo DS. Square Enix, Disney Interactive Studios. Axel: So, got it memorized, do ya? / Roxas: Have to hang onto something, right? It's not like I have memories from before. Don't you remember? I acted like a zombie. ^ Square Enix, h.a.n.d. (2009-09-29). Kingdom Hearts 358/2 Days. Nintendo DS. Square Enix, Disney Interactive Studios. Xemnas: Good tidings, friends. Today is a momentous day. I am pleased to announce that a new comrade has been chosen to wear the coat. Number XIV. Let us all welcome one of the Keyblade's chosen. ^ Square Enix, h.a.n.d. (2009-09-29). Kingdom Hearts 358/2 Days. Nintendo DS. Square Enix, Disney Interactive Studios. Riku: Find a new crowd. Trust me. Those guys are bad news. / Xion: Why? You're the real sham! / Riku: Fair enough. You could say I am...the biggest nobody of them all. ^ Square Enix, h.a.n.d. (2009-09-29). Kingdom Hearts 358/2 Days. Nintendo DS. Square Enix, Disney Interactive Studios. Xion: Who am I? What am I...here for? ^ Square Enix, h.a.n.d. (2009-09-29). Kingdom Hearts 358/2 Days. Nintendo DS. Square Enix, Disney Interactive Studios. Xion: Is it that I'm not supposed to exist? / Axel: Well, what do you want to do, Xion? / Xion: I want...I want to be with you two. / Roxas: Then come back with us. / Xion: I can't... Not the way I am now. But...what would it take for me to be like you? ^ Square Enix, h.a.n.d. (2009-09-29). Kingdom Hearts 358/2 Days. Nintendo DS. Square Enix, Disney Interactive Studios. Axel: Xion...what are you gonna do? / Xion: I've decided that I have to go back to where I belong. ^ Square Enix, h.a.n.d. (2009-09-29). Kingdom Hearts 358/2 Days. Nintendo DS. Square Enix, Disney Interactive Studios. Axel: Your mind's made up? / Roxas: Why did the Keyblade choose me? I have to know. / Axel: You can't turn on the Organization! You get on their bad side, and they'll destroy you! / Roxas: No one would miss me. / Axel: That's not true. I would. ^ Square Enix, h.a.n.d. (2009-09-29). Kingdom Hearts 358/2 Days. Nintendo DS. Square Enix, Disney Interactive Studios. Xion: You're next, Roxas. I have to make you a part of me, too. Don't you see? This is why I was created. ^ Square Enix, h.a.n.d. (2009-09-29). Kingdom Hearts 358/2 Days. Nintendo DS. Square Enix, Disney Interactive Studios. DiZ: It appears we've come to a standstill. / Naminé: Yes. / DiZ: This has gone on long enough. Riku...I think you know what needs to be done. / Riku: Right. ^ Square Enix, h.a.n.d. (2009-09-29). Kingdom Hearts 358/2 Days. Nintendo DS. Square Enix, Disney Interactive Studios. Roxas: How many times do I have to beat you? / Riku: All right. You've left me with no other choice. / Roxas: What? / Riku: I have to release the power in my heart—the dark power that I've been holding back. Even...if it changes me forever. ^ Square Enix, h.a.n.d. (2009-09-29). Kingdom Hearts 358/2 Days. Nintendo DS. Square Enix, Disney Interactive Studios. Riku: DiZ...he could feel Sora. / DiZ: Oh, he told you how he "felt," did he? Ridiculous. A Nobody cannot feel anything. / Riku: If he had met Sora, things might have been different. ^ Ransom-Wiley, James (2007-05-04). "Next Kingdom Hearts to be portable spin-off, not KHIII". Joystiq. Archived from the original on 2007-09-23. Retrieved 2007-09-22. ^ 『キングダム ハーツ』新プロジェクトも明らかに！ (in Japanese). Famitsu. 2007-09-20. Archived from the original on 2008-08-15. Retrieved 2007-09-23. ^ Gantayat, Anoop (2007-12-02). "Square Enix Unveils Jump Festa Lineup". IGN. Archived from the original on 2013-08-30. Retrieved 2007-12-12. ^ 初プレイアブル、初お披露目タイトルが続々！ ジャンプフェスタ2008にゲームメーカーがブースを出展 (in Japanese). Famitsu. 2007-12-23. Archived from the original on 2014-10-24. Retrieved 2007-12-25. ^ Haynes, Jeff (2008-08-02). "DKΣ3713 Private Party Impressions". IGN. Archived from the original on 2008-08-05. Retrieved 2008-08-05. ^ a b c Famitsu Staff (October 2007). キングダム ハーツ 358/2. Famitsu (in Japanese). Enterbrain and Tokuma Shoten: 27–28. Archived from the original (Translation) on September 21, 2015. Retrieved 2009-03-04. ^ "Fan Powered Q & A: Director Tetsuya Nomura Answers Your Questions". Square Enix. 2007-10-02. Archived from the original on 2010-07-12. Retrieved 2010-07-12. ^ スクウェア・エニックスのクローズドメガシアター、注目の最新情報をまとめてお伝え！ (in Japanese). Famitsu. 2008-10-09. Archived from the original on 2008-10-12. Retrieved 2008-10-14. ^ Gifford, Kevin (2008-06-18). "Square Talks Dissidia, Summer Event Plans". 1UP.com. Retrieved 2008-07-09. ^ Famitsu staff (2008-08-02). "PSP版『FF アギトXIII』の映像が初公開！　最新映像で明らかになった新情報を完全リポート" (in Japanese). Famitsu. Archived from the original on 2008-08-04. Retrieved 2008-08-03. ^ Sinclair, Brendan (2008-12-02). "Kingdom Hearts DS bound for North America". GameSpot. Retrieved 2009-01-22. ^ a b "Kingdom Hearts 358/2 Days for DS Reviews". Metacritic. CBS Interactive. Archived from the original on February 26, 2018. Retrieved June 21, 2010. ^ a b "Famitsu Rates 358/2 Days a 9/10 + More". HeartStation.org. 2009-05-20. Archived from the original on 2010-06-21. Retrieved 2010-01-16. ^ a b "Famitsu review scores – First Kingdom Hearts 358/2 Days score". NintendoEverything. 2009-05-19. Archived from the original on 2009-05-23. Retrieved 2010-01-16. ^ a b Vore, Bryan (2009-09-30). "Kingdom Hearts 358/2 Days". Game Informer. GameStop. Archived from the original on 2009-12-28. Retrieved 2010-03-01. ^ Stella, Shiva (2009-09-25). "Kingdom Hearts 358/2 Days Review for DS". GameSpot. Archived from the original on 2009-09-30. Retrieved 2009-09-26. ^ "Kingdom Hearts 358/2 Days Video Game, Review". GameTrailers. 2009-09-25. Archived from the original on 2009-09-28. Retrieved 2009-09-26. ^ a b "Kingdom Hearts 358/2 Days Review". Official Nintendo Magazine. 2009-09-09. Archived from the original on 2011-01-07. Retrieved 2010-08-30. ^ Stella, Shiva (2009-09-25). "Kingdom Hearts: 358/2 Days - Staff Review". RPGamer. Archived from the original on 2010-01-15. Retrieved 2009-09-26. ^ a b Hoffman, Chris; Steve Thomason (November 2008). "It Came From Japan". Nintendo Power. Future US (236): 44–45. ^ a b "Good Game stories - Kingdom Hearts 358/2 Days". Australian Broadcasting Corporation. 2009-10-26. Archived from the original on 2010-01-25. ^ Ashton Liu (2009-06-08). "RPGFan Reviews - Kingdom Hearts 358/2 Days". RPGFan. Archived from the original on 2010-01-11. Retrieved 2010-01-16. ^ a b VanOrd, Kevin (2008-10-09). "TGS 2008: Kingdom Hearts 358/2 Days - Trailer, Co-op, and Single-Player Impressions". GameSpot. Archived from the original on 2008-12-05. Retrieved 2009-01-22. ^ "Kingdom Hearts 358/2 Days: Staff review". RPGamer. 2009-10-03. Archived from the original on 2010-01-15. Retrieved 2010-09-01. ^ Graft, Kris (2009-06-08). "Japanese Game Charts: Kingdom Hearts For DS Leads May". Gamasutra. Archived from the original on 2012-12-13. Retrieved 2009-06-08. ^ Graft, Kris (2009-06-11). "Japanese Charts: Kingdom Hearts: 358/2 Leads For Second Week". Gamasutra. Archived from the original on 2009-08-14. Retrieved 2009-06-11. ^ Graft, Kris (2009-08-10). "Square Enix Profits Drop On Eidos Acquisition". Gamasutra. Archived from the original on 2012-02-12. Retrieved 2009-06-11. ^ Brian Ashcraft (2009-12-28). "The Top Thirty Games in Japan of 2009". Kotaku. Retrieved 2009-12-26. ^ Mark Matthews (2009-12-21). "NPD Top 20 Shows Strong Scribblenauts, Xbox 360 Performance". Gamasutra. Archived from the original on 2009-11-09. Retrieved 2009-12-21. ^ Carless, Simon (2009-11-12). "NPD: Uncharted 2 Heads October 2009 U.S. Game Sales". Gamasutra. Archived from the original on 2009-11-16. Retrieved 2009-11-12. ^ Magrino, Tom (2009-11-05). "Square Enix sales jump 33.2%, profits fall 55.7%". GameSpot. Archived from the original on 2010-02-26. Retrieved 2010-04-16. ^ "Readers' Choice". Nintendo Power. Future US (236): 66–67. March 2010. ^ "キングダム ハーツ 358/2 Days アルティマニア" (in Japanese). Square Enix. Archived from the original on 2012-05-10. Retrieved 2012-05-01. ^ "KINGDOM HEARTS 10th Anniversary 3D+Days+Re:coded BOX" (in Japanese). Square Enix. Archived from the original on 2012-07-15. Retrieved 2012-05-01. ^ "KINGDOM HEARTS Birth by Sleep & 358/2 Days オリジナル・サウンドトラック" (in Japanese). Square Enix. Archived from the original on 2013-08-30. Retrieved 2012-05-01. ^ "キングダム ハーツ 358/2Days Vol.1 The 14th" (in Japanese). Square Enix. Archived from the original on 2012-05-24. Retrieved 2012-05-01. ^ "キングダム ハーツ 358/2Days Vol.2 Go to the Sea" (in Japanese). Square Enix. Archived from the original on 2012-05-24. Retrieved 2012-05-01. ^ "キングダム ハーツ 358/2Days Vol.3　Xion-Seven Days" (in Japanese). Square Enix. Archived from the original on 2011-08-22. Retrieved 2012-05-01. ^ "Kingdom Hearts: 358/2 Days Manga to End in Japan". Anime News Network. 2012-08-03. Archived from the original on August 5, 2012. Retrieved August 3, 2012. ^ "キングダム ハーツ 358/2Days(1)" (in Japanese). Square Enix. Archived from the original on 2013-10-21. Retrieved 2012-05-01. ^ "キングダム ハーツ 358/2Days(5)" (in Japanese). Square Enix. Archived from the original on 2013-03-06. Retrieved 2012-02-23. ^ "Re:Chain Of Memories Style Remake Was Considered For Kingdom Hearts 358/2 Days". Siliconera.com. 3 October 2012. Archived from the original on 31 July 2017. Retrieved 4 August 2017. ^ "Nomura Teases Kingdom Hearts II HD And Other Kingdom Hearts HD 1.5 Remix Tidbits". Siliconera. 2012-10-02. Archived from the original on 2013-08-13. Retrieved 2012-10-03. ^ Romano, Sal (2012-12-20). "Kingdom Hearts HD 1.5 Remix Japanese release date set". Archived from the original on 2013-08-15. Retrieved 2013-05-07. ^ Robert Peeler (2013-02-26). "Announcing KINGDOM HEARTS HD 1.5 ReMIX". Square Enix. Archived from the original on 2013-02-28. Retrieved 2012-02-26. ^ "KINGDOM HEARTS HD 1.5 ReMIX, releasing exclusively for PS3". PS3 News. 2013-02-26. Archived from the original on 2013-06-14. Retrieved 2013-02-26. ^ "Kingdom Hearts HD 1.5 ReMIX coming to Europe!". Square Enix. 2013-02-25. Archived from the original on 2015-11-05. Retrieved 2013-02-25. ^ Nunneley, Stephany (October 27, 2016). "Kingdom Hearts HD 1.5 + 2.5 Remix announced for March release on PlayStation 4". VG 24/7. Archived from the original on November 1, 2016. Retrieved October 27, 2016. ^ Gilyadov, Alex (June 12, 2017). "E3 2017: KINGDOM HEARTS HD 1.5 + 2.5 REMIX FREE DLC ADDS THEATER MODE, NEW SCENE". IGN. Archived from the original on July 30, 2017. Retrieved July 30, 2017.